Casa Mia is an old renovated stone house located in the quiet village Paliski near Marusici, distant 17 km from the sea and only 4,5 km from the beautiful Momjan. The area is well-known for quality restaurants and konobas (typical istrian taverns), top vintner and olive oil producer but most famous for the delicacy of the white truffle, ideal for top gourmet experiences. The house was built in istrian style and furnished with combination of rustic and modern furniture. 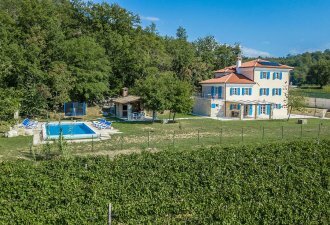 Situated on an enclosed property of 1000 sqm with panoramic view on the surrounding hills where the guests have on their disposal a well-kept garden with barbecue area, two terraces with sitting set, pool of 24 sqm with sunchairs and parking in front of the house. House for 4 persons with a living area of in total 148 sqm consists of two properties. The house (120 sqm) consists of a ground floor in which is located a living room, completely furnished kitchen with dining table and fireplace, storage, shower/toilet. On the first floor there is double bedroom with double bed furnished with traditional furniture and one spacious double bedroom with double bed furnished with modern furniture, shower/toilet. In the other house (28 sqm) the guests have on disposal a small summer kitchen, sauna for 2 persons, shower/toilet and covered terrace.